Well, that was the mammogram from hell. My first mammogram from hell, after two decades of annual mammograms. Men certainly suffer physical exam indignities. But I doubt any man in a medical office was treated with the condescension I met this morning. Ever. Privacy was not the problem. Heavens, I've given birth three times. Once a mother, few women think twice about a bit of breast-flashing in a medical setting. No, privacy's not the issue. The problem was the attitude of the energetic radiology tech who rushed through what's probably a boring drill for her. Older woman. Healthy patient. Routine exam. Blah blah blah. She raced down the hallway, oblivious that I'm a slow walker, given my wobbly right hip. When she noticed me lagging behind her track-star pace, she coaxed me sedately as though I was not comprehending her "OK, turn right. Now it's the fourth door on your right. See? This door..."
She directed me to the usual chair encircled by a hospital curtain, but cautioned, "Don't sit down. It's hard to stand back up again!" Huh? I sat down, removed red tank-top and pink bra, then donned the requisite ugly front-opening half-gown. I stepped to the digital radiology equipment (see above), and started to lean in exactly as I've done yearly since the medical group went digital. The tech rushed over... "No sweetie, not like that. Just follow me. Drop your arms. I'll show you..." Sweetie? I go limp, and let her contort my arms and chest into awkward picture-friendly positions. And then it happened. Once.Twice. Two more times for lateral views. She affixed my breast between the two mega-slides, then ZAP, she auto-closed the slides. For good measure, I assume, she then manually twisted knobs twice (or more?) to tighten the vise with the power of a weight-lifter. Electricity coursed through my system. Shocked, I briefly yelped. Never before have I experienced intense pain at a mammogram. This pain was searing. I told her it was too tight. Her response? "Be quiet. You need to hold still." Uh, what? "Look how red my breast is," I nicely complained about my mottled strawberry-red skin. "Happens to everyone," she quipped, not bothering to look. She rapidly repeated her process three more times. Never letting up the unnecessary pressure. Never listening or responding to me. In fact, the last two, it seemed she clamped that vise down a tad harder, if that was physically possible. But maybe my breasts were so sore by that time, the torture felt more acute. Intimidated, I stayed quiet. Lest you think I'm a whiner. I've been told by the best that my pain tolerance is pretty high (except for childbirth, of course). A respected orthopedic surgeon once lectured me at length that I need to be more aware of pain. That being too mind-over-matter coupled with obliviousness to pain is not a formula for good health. I sat in the curtained chair to clothe. Done with her tasks, the radiology tech shouted to me, "Do you know how to get to the lobby? Turn left out of the door, then left at the corner." She abruptly exited another door, slamming it hard in her hurried wake. I am grateful beyond measure for good medical care. I am grateful for the technical skills of this radiology tech. I am grateful that almost without exception, I have dealt with medical professionals who treat patients with respect and reasonable sensitivity. Today, though, I experienced the mammogram from hell. This mammogram was painful and more than a little humiliating, and in only 20 minutes. 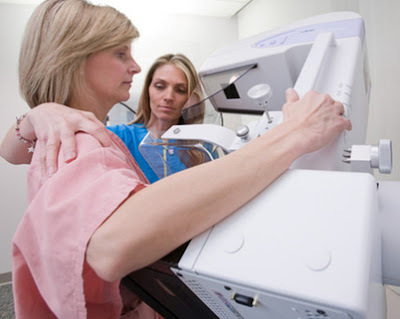 I finally understand why many women detest, and often wrongly avoid, mammograms. Hard to imagine that men are treated with the same indifference or condescension as shown to me in this simple medical test.